Introducing my latest pattern: Berrie Pie! This adorable sleeveless dress for babies and toddlers has a knit-as-you go flower stitch pattern that is perfect for colorful hand-painted yarns. Design features include a button-up back, scalloped collar and hem, and an optional built-in diaper cover. 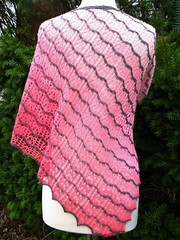 Inspiration: I love buying hand-painted colorful yarns, but sometimes it can be difficult to match them with a pattern. The flower-stitch pattern on the skirt of the baby dress breaks up pooling and flashing nicely, and takes full advantage of high-contrast hand-painted colorways. The scalloped neck and hem use short rows to play with color too. I designed a built-in diaper cover with snaps to make it an easy-wear garment and prevent riding up. 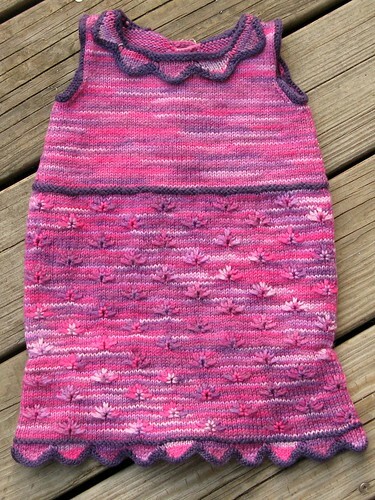 I designed this garment with my friend’s baby girl in mind, and the prototype (in pink, below) found a home with her. Design/Skills Needed: This is a challenging pattern with a lot of little quirks! The diaper cover is worked flat, then set aside. The skirt begins with short-row scallops and is then worked in the round using a slip-stitch flower stitch. The diaper cover is knit in at the hip. After the waist, the bodice is worked flat. Button bands and holes are worked as you go. 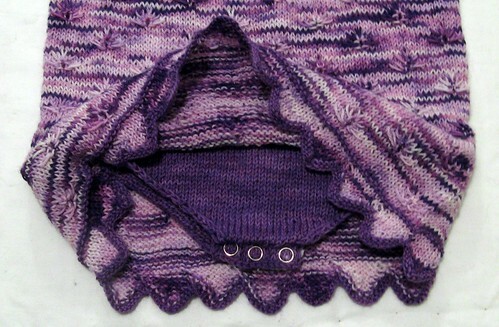 The collar is knit separately, then joined to the neckline. Knitters should be comfortable with a wide variety of stitches and garment construction, and be willing to read the pattern closely. This is adorable! and the built-in diaper cover is inspired! I think the pink you used shows the flowers and scallops better. On the other hand the purple is gorgeous.